Well, there goes a BMW M3-fighting G70 N.
The just revealed Genesis G70 is undoubtedly the best-looking of the new luxury brand’s lineup. It also has the most performance potential. Sadly, however, the luxury brand has opted not to give any of its cars the high-performance N division treatment. Speaking to Australia’s Motoring, Genesis boss Manfred Fitzgerald confirmed that none of the cars, at least at the moment, will be turned into potential BMW M division fighters. “Performance will not be on the same forefront of differentiator as it is today for internal combustion engines (ICEs). “Everybody is capable of doing an electric motor and putting it in a car, so the performance values will almost be the same. Nobody’s going to be interested in ‘A’ or ‘B’, so I think that will come down to a level playing field, Fitzgerald said. “Trying to tack something on top of that, I don’t think that will be rationally, really a wise move.” What the guy’s essentially saying is that electric motors are already capable of outperforming internal combustion engines, so why even bother spending the time and money developing a hot G70 if things are going the way of, say, the Tesla Model S. Even Porsche is heading in that direction. Fitzgerald is also keenly aware of motorsport heritage, something which BMW M has lots of and Hyundai N has absolutely none. 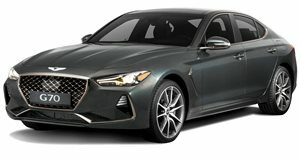 But his bottom line thinking is this (and it makes an awful lot of sense): “If you look at the performance value of an electric vehicle today, there are lots of ICEs that really struggle to keep up with that.” Future Genesis cars, both regular and high-performance, sure sound like they’ll be pure-electrics, an area that’s currently void of heritage. But in the meantime, we think Genesis is missing out on a short-term opportunity. A G70 N is totally possible and, as BMW very well knows, there’s a strong market for performance. Even if a G70 N can’t beat an M3, it’d still be a chance for the brand to start building some high-performance street cred prior to the EV invasion.